Looking forward to enjoy the Italian culture? 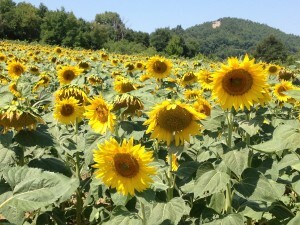 Would you like to travel to the beautiful, green Umbrian landscape and its rolling hills? 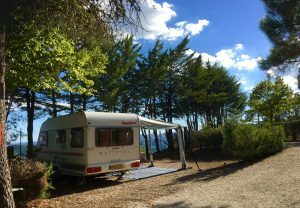 And would you like to stay at Camping Luna del Monte? Then book a tent pitch at the campsite right now! You can do this easily by completing the reservation form as below and send it. All tent pitches are accessible by car and have a minimum size of 50-80 m2. Each pitch is surrounded by a green hetch which offers quit some privacy. From some of the tentpitches you have a lovely view of the surrounding hills. At each pitch is electricity available and there is a water dispenser nearby. There are a couple of pitches reserved for campers with a caravan or a mini-van. These pitches are located along the main path. They have a minimum size of 50-80 m2 and are surrounded by a green hedge. Electricity is available at each pitch and a water dispenser is nearby. 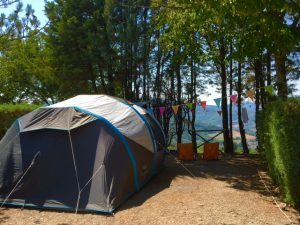 The campsite can be reached with a caravan, but keep in mind that the climb to Monte Santa Maria Tiberina is quit steep at some parts and that your car does need to have some horsepower. 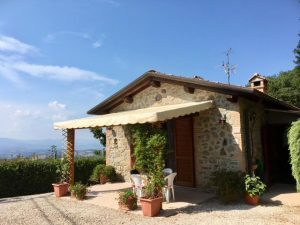 The holiday home is a characteristic Italian holiday home, adapted for 2-5 guests. It’s located right next to the campsite, and 20 stair steps from the swimming pool at the campsite (free use). There is a nice living room with a sofa(bed) and an open modern kitchen which is fully equipped, one bedroom with a double bed and a single bed. The separate bathroom had a shower, toilet and wash bassin. The holiday home has a large veranda at the frontside with a private terrace and a large table with seats. Total area: 50 m2. Minimum stay LS is 3 nights, high season 7 nights. Includes gas, water, electricity, bedlinnen and use of swimming pool at campsite. Excludes final cleaning (€ 40,00). 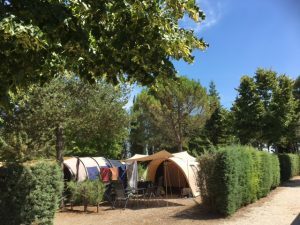 If you have any questions, please do not hesitate and send an email to the following address: info@campinglunadelmonte.nl See you in Umbria!